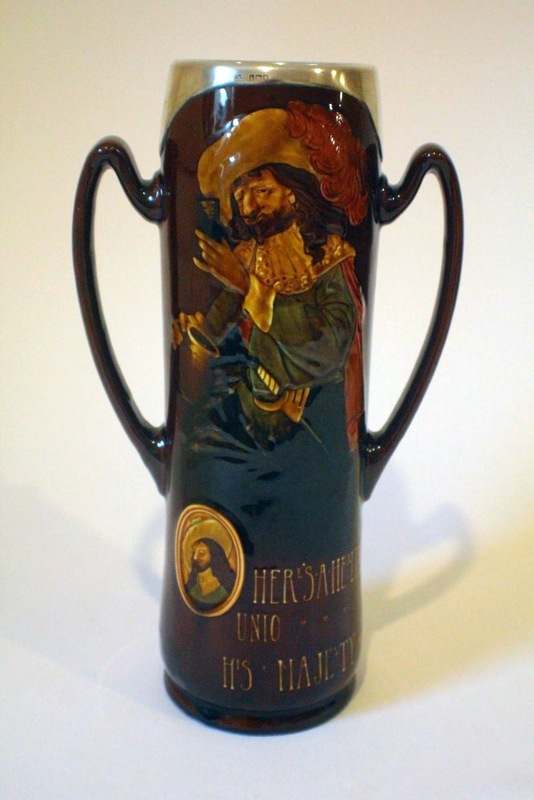 Well in the case of this flask or vase it is certainly Holbein. Although Similar in style to Rembrandt with its portrait cartouche the body immediately tells us it isn’t. Rembrandt ware can be distinguished by its body and typically rough surface indentations, together with its heavier weight. Yet, it is often harder to distinguish between Holbein and Kingswares as their style of decoration is similar, as it the body used for both. Originally the difference was in the price, the latter being cheaper to produce and indeed Holbein has been referred to as a more expensive product to Kingsware with added individual decoration. This piece was a Charles Noke design as can be seen from his impresses signature. Backstamps often help us identify Rembrandt and Holbein wares, however, these were often omitted for one reason or another, so today we must use our detective skills to distinguish between these wares! It is unusual to think of Collecting just clocks but of course there are dedicated clock collectors out there. When it comes to Royal Doulton, collectors are usually happy with one or two examples, unless we’re talking about Kingsware collectors! Clocks have been produced at both Lambeth and Burslem over the years and even in relatively modern times. Stoneware examples are naturally magnificent and by greats such as Tinworth, although more modest Silicon examples were also produced at Lambeth which can be bought relatively modestly today. The topic here is Kingsware and there are a handful of wonderful art nouveau designs that can be found as part of this range. So far (that’s always the way to think) there have been five subjects found on Kingsware clocks, which themselves have been recorded on three shapes. Whilst many remain undated, I did once see an Alchemist one dated 1904 and imaging the others to date from this period given their art nouveau decoration. Patience is the watchword when embarking on collecting this series of clocks, not to mention deep pockets! Yet, that is what makes collecting rewarding, isn’t it? An interesting Kingsware Loving Cup. Another chance find- this Kingsware loving cup from 1905 complete with sterling silver mounts and standing an impressive 13″ tall. No doubt made to commemorate England’s new monarch Edward VII, who succeeded his mother Queen Victoria to the throne in 1901. 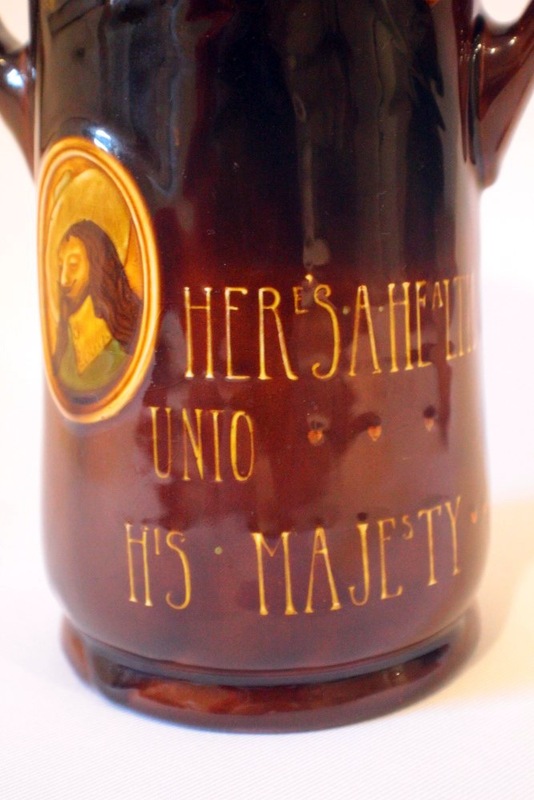 The cup is emblazoned with the motto “Here’s a health unto his Majesty”. The cup was later adapted to a jug in 1936, to commensurate the approaching coronation of Edward VIII, that of course never happened due to his abdication. This flask version was made for Dewars in a limited edition of 600. The magnificence of the loving cup has to be seen in the flesh to be appreciated. 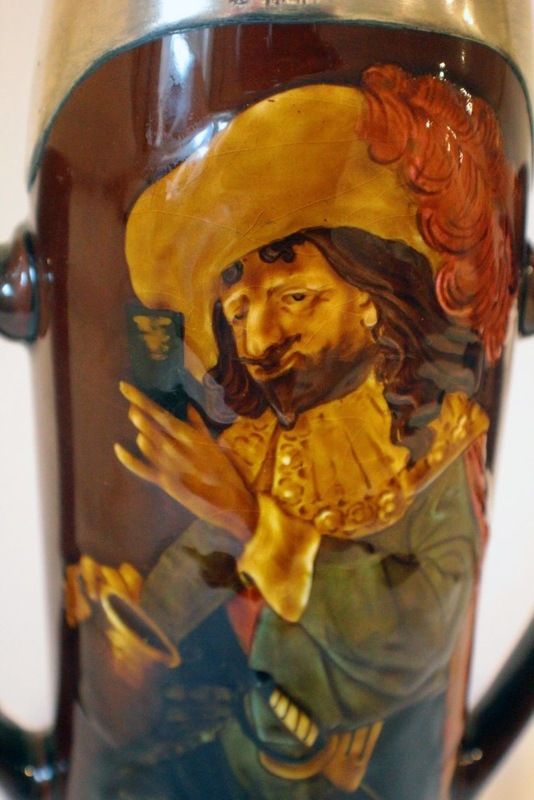 Certainly the detail is much more vivid than in the later flask, the latter is also missing the cameo image of the Cavalier. Interestingly the sterling silver mounts are stamped G B & S, for George Betjeman & sons, a prestigious London silversmiths, who commissioned many Doulton Burslem pieces including a Kingsware spirit barrel with tavern scene, Kingsware tobacco jars including the large pipe that can be found and smaller Kingsware ash trays – all with sterling silver mounts supplied by them. In addition to Kingsware, they also commissioned Shagreen items from Doulton for their exclusive store too.